Looking for a New Bentley Bentayga in your area? 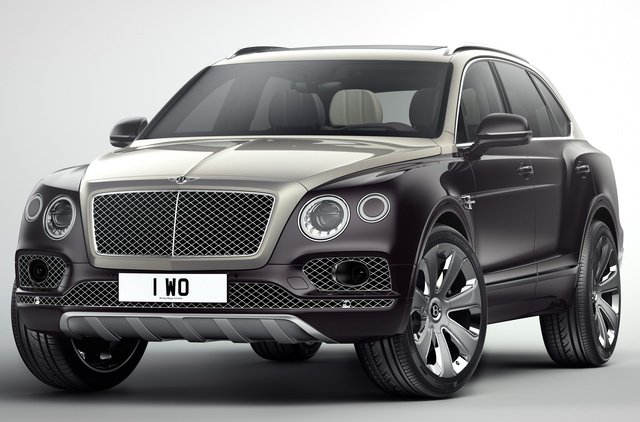 CarGurus has 44 nationwide Bentley Bentayga dealers with 264 new car listings. When the Bentley Bentayga launched in 2016, the idea of a luxury SUV was still novel. Since then, new competition like the Lamborghini Urus and the Rolls-Royce Cullinan have rushed to fill the space. For 2019, Bentley adds a new V8-powered trim and new customization options. Bentley skillfully adapted the its design elements for an SUV profile, resulting in an athletic and graceful SUV with four round LED headlights and a signature grille, creating a commanding look. This year, new red brake calipers debut on the Bentayga V8 trim for an even sportier look, and a new 22-inch wheel design accents this new performance-oriented feature. The Bentayga features a turbocharged 6.0-liter W12 engine rated for 600 horsepower and 663 pound-feet of torque, matched with an 8-speed automatic transmission and all-wheel drive (AWD). The AWD system can be upgraded to include the All-Terrain Specification package, which adds four drive modes, underbody skid plates, and a front-view camera. For 2019, the Bentayga V8 trim offers 542 hp and 568 lb-ft courtesy of a twin-turbocharged 4.0-liter engine. This model also gets the 8-speed gearbox and AWD. The new powertrain is the more efficient of the two thanks to a cylinder-deactivation system, with EPA estimates of 14 mpg city, 23 highway, and 17 combined. In 2018, the W12 model earned EPA ratings of 12 mpg city, 19 highway, and 15 combined. Inside, the cabin is sumptuous and the customization options are nearly limitless. The Bentayga can hold five passengers across two rows with two-tone, hand-stitched leather upholstery if desired. Interior trim options include wood, metal, matte carbon fiber, and a new gloss carbon fiber. Bentley has also added a wood-and-leather steering wheel to the options menu. The Bentayga’s infotainment system features an 8-inch touchscreen display that also offers gesture control, and standard tech such as Bluetooth, Apple CarPlay, a Wi-Fi hotspot, and navigation. A 10-speaker audio system comes standard and can be upgraded to a 12-speaker or 18-speaker Naim system. Though the Bentayga has not been tested for crashworthiness, it includes plenty of high-tech safety features, including a reversing camera, forward-collision warning, blind-spot monitoring, rear-cross traffic alert, traffic-sign recognition, and parking sensors. Adaptive cruise control, lane-keep assist, and a head-up display (HUD) are available. The super-premium SUV category is here to stay, and the Bentayga is the clear leader. The new, more efficient V8 engine option only adds to the Bentayga’s appeal. Cherise is a Chicago-based freelance writer and editor with nearly 15 years of experience covering the automotive industry. Cherise loves writing about car culture and sharing common-sense car-buying advice. She is eagerly awaiting delivery of a 2019 Subaru WRX Series.Gray, which will join her household's 2008 Toyota RAV4, 2007 Genuine Buddy Italia 150, and 2015 Honda Grom. What's your take on the 2019 Bentley Bentayga? Have you driven a 2019 Bentley Bentayga? Enter your zip to see incentives for a new Bentayga in your area. Looking for a Used Bentayga in your area? CarGurus has 248 nationwide Bentayga listings starting at $153,774.